The unique power of Stand Up Comedy is a power people tend to bestow upon various forms of entertainment. This is the power of bringing people together, and in my opinion, Stand Up Comedy’s ability to unite an audience is unmatched by all other preforming arts. Everyone can relate to a time when they were watching something funny on the television alone, laugh out loud, and immediately look next to you as if your companion was sitting by your side. It’s natural to want to laugh with people, which is one way Stand Up Comedy shows bring people together. The intimate setting of a Stand Up Comedy club is where it all starts: the lights are dimmed, strangers and friends are sitting close, and the performer is in life-size view in front of you. 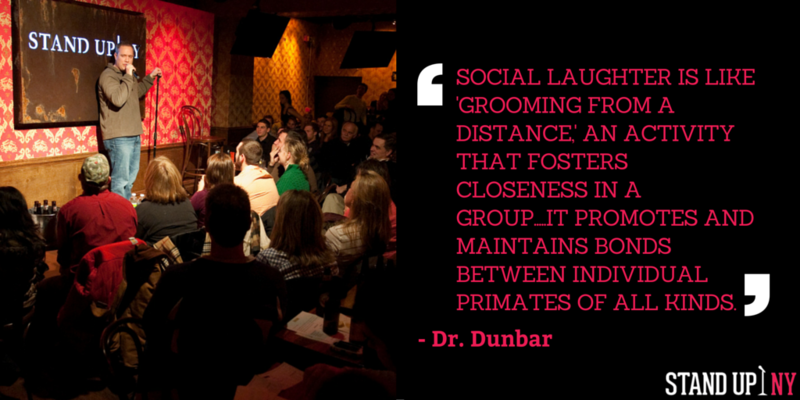 At a comedy club, you are placed right in the action, which helps members stay engaged. Engagement from the audience is essential for this power of bringing people together to occur during Stand Up. The more an audience is engaged the more they become a group. This group is unlike any other because it has nothing to do with personal details of audience members like most groupings in today’s society. The group is simply the audience of a certain show, and what they share in common is this engagement and willingness to leave negativity at the door. All other issues, rankings, and stress can be set free as all audience members become equal and feel inclusive in the all-embracing Stand Up atmosphere. Once an audience is engaged and feeling comfortable in their surrounding it is easy to see this unique power take over. Stand Up Comedy is a show that brings all people together in laughter. It doesn’t matter who you are or where you’re from. Everyone enjoys to laugh, and what better way to laugh than surrounded by people to laugh with you. Even with family members you may not see eye-to-eye with; going to a Stand Up show can help put those issues to rest as you come together and laugh. The power of laughter and not taking everything seriously can over take an audience and brings them together by taking away all casualties and realizing life is too short not to get a good laugh out of it. Whether it is politics or personal issues, Stand Up Comedy takes those issues and levels them out by making a joke everyone can laugh at and easing the tension. That is why Stand Up Comedy’s unique power should be embraced and brought to everyone’s attention. Come stop by one of Stand Up New York’s shows and feel the fellowship and sense of community brought to you by a Stand Up performance. 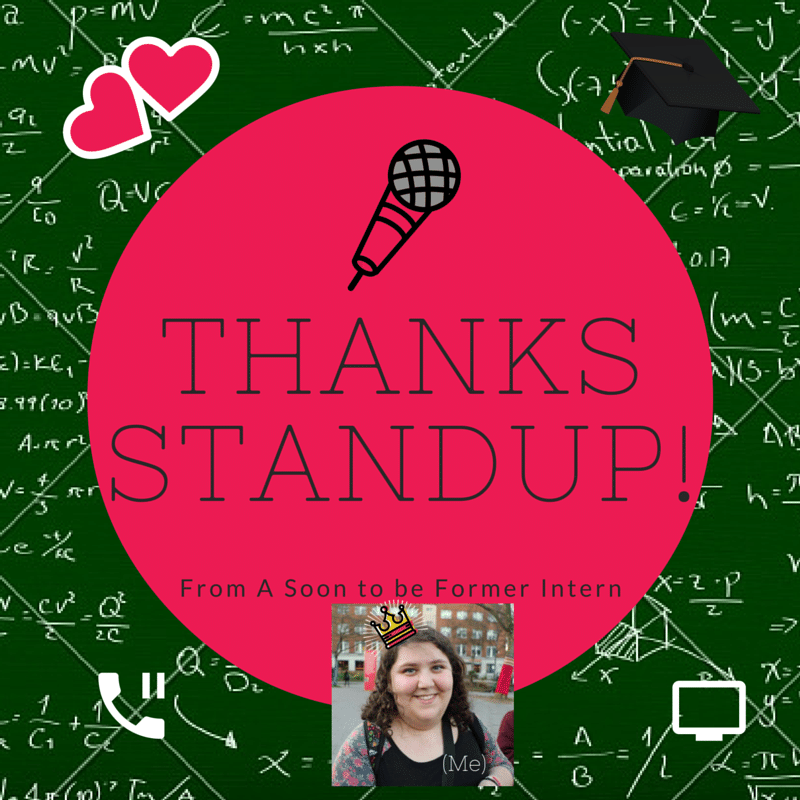 Click here for more information on Stand Up NY’s line up and get FREE TICKETS using PROMO CODE mckenzi! My name is Tova Tencer and I am currently a senior at the Bergen County Academies in Hackensack NJ. This is Bergen County’s magnet school, we are the proud, the few, the nerds. The school offers nine distinct programs over seven academies, ranging from culinary arts to medical, to engineering. I was lucky enough to be accepted into the Performing Arts program. The school is special in many ways, one such way being the Senior Internship program. Every Wednesday of senior year, students get the opportunity to go out into the world and get a taste of a real job. Many of my theatre peers went to worth with theatre companies all throughout NYC, but I knew I needed something else, something special. I wanted to work in comedy. I’m attending Emerson College next year to work towards a BFA in Comedic Arts, so I didn’t want just a dry theatre company. I was apprehensive at first. Making phone calls, asking working professionals for a job, I felt so incompetent! But I needed an internship. In the end, my mother had to make some of the calls for me, luckily she couldn’t go on the interview with me too. I feel I have grown a lot in my time here. The year seems to have flown by me and suddenly it is my last day here. Even though I could only work one day a week, there was always something new and interesting for me to do. The club is a hub of activity. I tackled everything from writing blog posts and email blasts, to stacking and labeling tickets (which is actually a lot more fun than it sounds). I love to write and knowing that a cute Valentine’s Day add I wrote got sent out to thousands of people is really exciting. I also had to, yes, answer phones. This is a task I think everyone my age dreads, but I’ve studied improv, so how bad could it be? It took a while to get used to, in fact, I’m still not used to it, but that isn’t important. I can do it now. I’m eighteen years old, a senior in high school and about to go to college, talking to people in person and on the phone are skills that I need in my toolbox, that I now have thanks to SUNY. I also spent time compiling, names, faces, and bios of comedians who perform here. As someone who wants to continue in this industry into adulthood, knowing the landscape and professionals is a constant and a must. 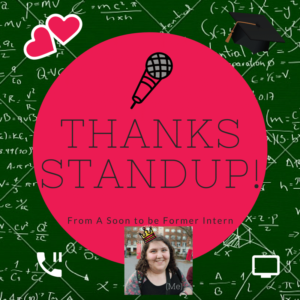 Being able to see exactly how a club like Stand Up NY is run was enlightening. Finding out not only how the comics get on stage, but how you, the audience, gets in your seats, really paints a complete picture of how businesses like this one works. You know those guys in times square who sell tickets? Now I know how important they are to the businesses they represent. I know how much organization it takes to balance the budget, the acts, ticket sales, inventory, special promotions, events, and employees all while keeping the lights on. This internship was quite the experience and dip into the professional world, so if you are interested, here’s my advice. You need to be flexible, eager, and brave. Flexible because things change, and you need to be able to handle any task that is thrown your way. Eager because if you tackle each new assignment with enthusiasm and positivity, not only will people like you more, but you will do better. Finally, you need to be brave. No one is going to force you on a stage, but in real life, you can’t hide whenever the phone rings, or when someone asks you a question you don’t know the answer to. Being brave means finding the answers so that you know. Bravery is being willing to grow. Thank you, Stand Up NY for giving me this opportunity.